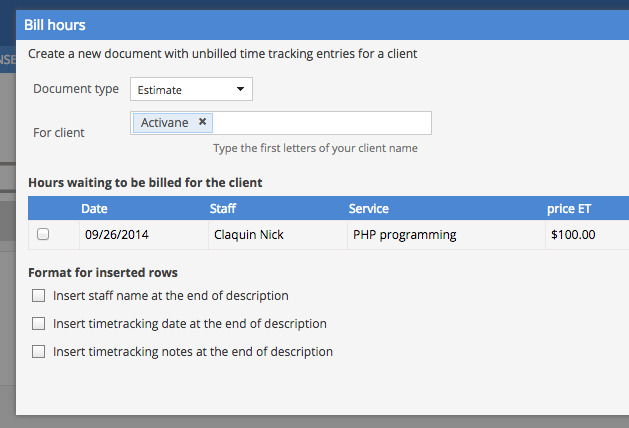 The time tracking add-on is fully integrated with the Project Management add-on. You can track your time on projects and view the hours spent overall on a project. To enter time for a project entry, click on the entry and display the time tracking tab. Click the Add button and enter your time. The entry is in the Displayed tab. (Important: time tracking entries of a project can be associated with a sales record for margin calculation). Your entry will now display an icon indicating a time tracking entry. 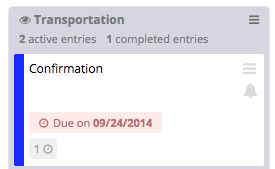 Clicking on this icon directly will take you you to the time tracking tab of the entry. 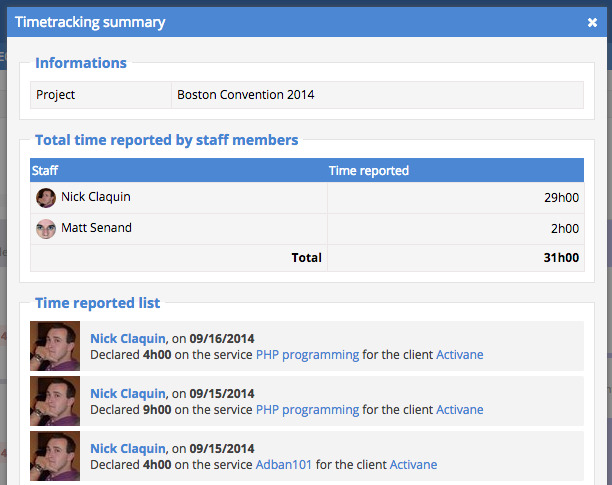 At any time, you can get a comprehensive overview of a project's time tracking. To do this, click the button above time tracking. A window appears with a summary of the project and it's associated hours. Note: you can access the list by clicking close on the menu list and then clicking Time tracking. If you use the Hours Rebilling add-on, you can easily integrate these hours and generate the invoice from the time tracking menu, and then clicking Bill hours.